There is something quite liberating in jumping. It's as if one throws away all caution to the wind and just "go for it". Jumping makes one smile... or laugh. Go ahead. Try jumping now and feel your face muscles move in synchronization with the jump. We are a crazy family of jumpers. We love to jump at every photo shoot. It does not matter what the occasion or location is. We jump - for the sheer fun of the action. So, what time or place is appropriate for jumping? We jump right after watching a movie. The movie might have been wonderful or not. Nevertheless, we jump. The movie was great! Let's jump for joy! 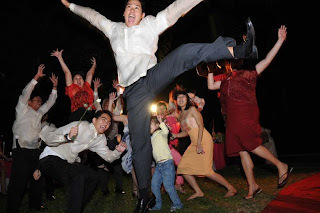 We jump at weddings. Never mind if we're in formals et al. Never mind if the in-laws think us weird for jumping. It does not matter. We love to jump. Yey! The wedding is over! 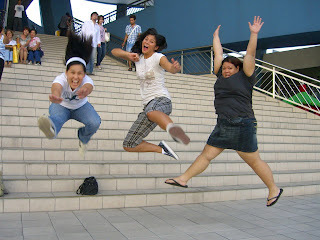 We jump at the beach - making the action more fun than it seems because of the refreshing beauty of the venue. We jump after eating out. The jumping might actually burn some calories. We jump just to show the beauty of it. Stop whatever you're doing now and jump! Do it! interesting family!-laughter is the best medicine and jumping just does it ! Those were great shots making a splendid theme. lynne: go ahead and put on your padded shoes! collins: yup! jumping sure pumps up some adrenalin and happy hormones. huling: ay sows! may kwento ako. artista na ko!!!! i'll do a post about it.